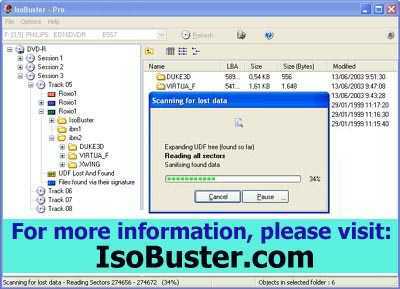 IsoBuster is high-end software to do data recovery from all types of media ranging from optical (CD DVD BD) to flash drives (USB Sticks MMC Compact SD cards) and Hard Drives. All File-Systems are supported. Scanning for lost files and folders Surface scanning. By better Error handling and several retry-mechanisms IsoBuster has a fair chance of recovering your data. The use of alternative ways to get to the data means that you get the best out of your drive. Furthermore IsoBuster circumvents Windows and does everything by itself it communicates directly with the devices and takes care of all the data interpretation. As a result discs stay readable after problems such as a Buffer Under-run or a failed disc finalisation and all common file-systems even the ones not supported by Windows are recognised and interpreted by the program. The program is however not limited by the file-system standards it copes with a vast range of possible issues hard coded or via virtual intelligence and on top of this it is able to build file lists based on file-signatures independent from any file-system data. Supported file-systems are ISO9660 Romeo Joliet Rock Ridge UDF 1.02 up to 2.6 HFS HFS+ IFOVOB NTFS FAT. Additionally IsoBuster takes care of all sorts of drive-disc incompatibilities such as support for Mount Rainier discs in non-Mount Rainier drives. All this means that any currently available optical disc (from CD to HD DVD to ...) is supported even discs not created on Windows such as Mac HFS discs or Mavica digital camera disc etc. Additional features are : The support of an enormous range of image files which are identical copies of CD BD or (HD)DVD saved into a file they are dealt with as if they are actual discs.